Have you heard the story of astronaut pens? At the dawn of the space program, NASA encountered a sticky problem. They discovered that ball-point pens would not work outside of our atmosphere. 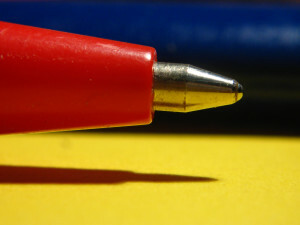 The government quickly went to work developing a special new pen which could write upside-down, at any temperature from freezing to boiling, on any surface known to man, at any pressure, and in zero gravity. People were hired and ideas were considered, developed, tested, discarded, and considered again. Hours of research went into the project, and it was made top priority in the department. It took many manhours and twelve billion taxpayer dollars to come up with the space pen, but NASA finally got it down. The Russians, of course had the same problem. Okay, fine… truth be told, this is just an urban legend. It never really happened. But it’s still a perfect metaphor for the plot problems you might be having. Are you wrestling with why your protagonist would feel the need to serve as whistleblower on his company when he’s been working there happily for twenty-five years with no issues? Does it not make sense that the daughter would fall in love with the gardener upon whom the whole rest of the story hinges? Do you have a handful of stubborn characters who just won’t do what you tell them? Don’t get so stuck in your path that it becomes a rut. It’s your path, your story. You can make up whatever the heck you want. Just write it another way and see what sticks. Assuming you aren’t staring down some giant deadline (and really, even if you are), what’s the worst that could happen? You write something in a totally different direction, and toss it later to return to your original idea? What’s the loss there? That your creative juices are now flowing and you pushed the stubborn what-ifs out of the way? That you ignored some formula or outline that obviously wasn’t working so well anyway? Standing still is never a good idea. Keep it moving. Even if it’s in a direction you don’t like. Even if the idea seems so freakishly simple that it sounds stupid at first thought. Let it go, and write something on the page. You can always go back later and fix it. Who’s going to read it if you’re unhappy with it in the end? Easy: no one. Don’t show them. Problem solved. But having written it, quickly and without fear of failure or public judgement, you’ll have opened up the vein and will have a better idea of where you can take your characters, who they are, and the things you do and do not need to worry about on the next trip through. Thankfully, stories don’t cost anything but the author’s time and a bit of effort; you won’t have a twelve billion dollar debt to explain. And first drafts aren’t permanent. Take a practice run and stop freaking out. Freaking out won’t get you anywhere but further into your rut. Remember why you got into writing in the first place. I’m betting it’s because you had something to say. When you start worrying about the details, you stop speaking. So just speak anyway. Go. Do. Overthinking to the point of inaction will completely kill your sense of creativity, and it’s more work than trying something twice. The best part is that once you can let go, you’ll usually find the answer was in your shirt pocket the whole time, just waiting for you to remember it. Fun article, considering I actually own one of those space pens: the Fisher Space Pen. Got it on a trip to North Carolina in one of those pretty writing shops that sold all kinds of paper and writing implements. But I do think the process of writing is an interesting one. Sometimes I struggle with how to present something, then at other times, it all just seems to come together, just flowing out on to the computer screen without effort. Sometimes, I end up creating sentences that show foreshadowing, and I didn’t even plan the writing that way. It’s especially fun to see the dialogue come together, with the characters bantering back and forth. I’m enjoying the writing journey, and I love even better the way I feel when I’m in the middle of working on a novel or novella. I remember wanting a space pen when I was little. I think that’s why I love the anecdote so much, regardless of whether it’s true in the slightest. That, and I am the type to stress over pen design and leave my poor little pencil sitting there, haha. That feeling is what it is all about, isn’t it? And I think you’re right. Once you get the craft down, happy accidents are the rule and not the exception. The subconscious takes care of so much, if we can just get out of its way.